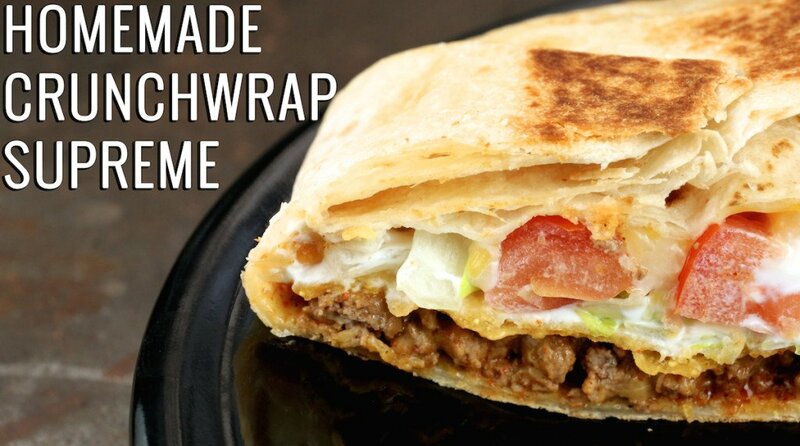 You can now make everyone’s favorite Taco Bell item, the Crunchwrap Supreme, at home with this easy to follow recipe. Just like the fast food version, this homemade Crunchwrap Supreme is packed with all the toppings! Jess and I have been talking about making a homemade Crunchwrap Supreme for over a year now. We are proud to announce that it has finally happened! We were so excited about the accomplishment we ate one for lunch AND for dinner 😉 (hey, we shared). We do try and stay away from eating fast food as much as possible, but once in a while, it’s necessary to indulge. It’s even better when you can make it at home with high-quality meat and fresh veggies from your local grocery store. I won’t lie though, I still slathered my share with leftover fire sauce from a previous visit to Taco Bell. ? This was super easy to make and, I’ll say it, better than the original! You guys seem to really love it too because it has become the most popular recipe on our site receiving millions of views! 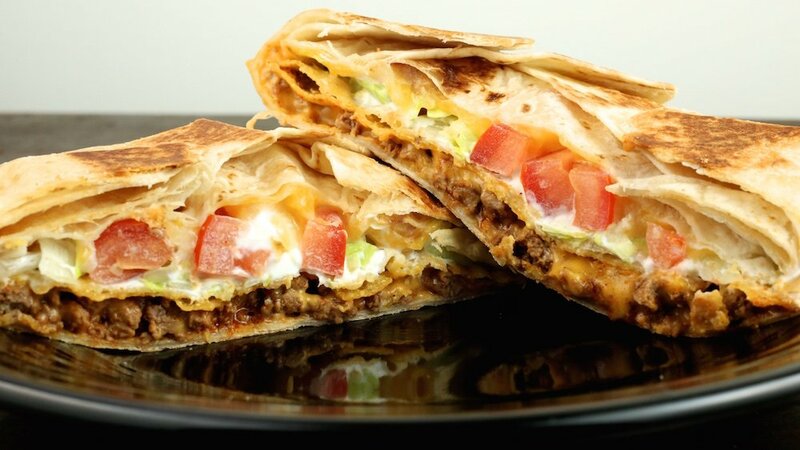 We get comments and e-mails daily for readers telling us how much they and their families enjoy this homemade version of the crunchwrap supreme. Some have even tweaked it to their liking or made it fit their diet by creating a vegetarian/vegan version. Be sure to scroll down and read the comments to find those! Wondering what all goes in a Crunchwrap Supreme? The answer is a lot. I think that’s why everyone likes it so much. It’s the ultimate taco bell treat! In a skillet or large cooking pan, cook and crumble the ground beef over medium-high heat. When it is no longer pink, drain the grease. 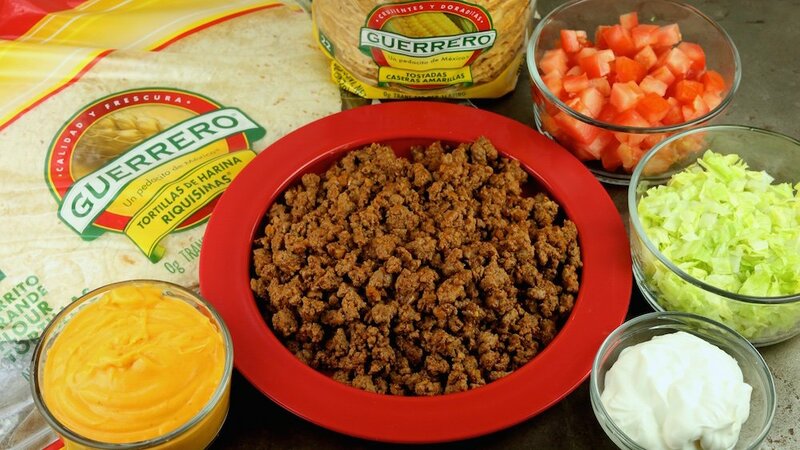 Place meat back into the pan and stir the taco seasoning mix as well as the water it calls for on the packet. Cook according to the package instructions. Warm up the nacho cheese sauce in the microwave and set aside. Place the flour tortillas on a plate and warm in the microwave for about 20 seconds. Place ½ cup of taco meat on top of the nacho cheese. Next, add the tostada shell, a thin layer of sour cream, lettuce, tomato, and lastly, the shredded Mexican cheese. 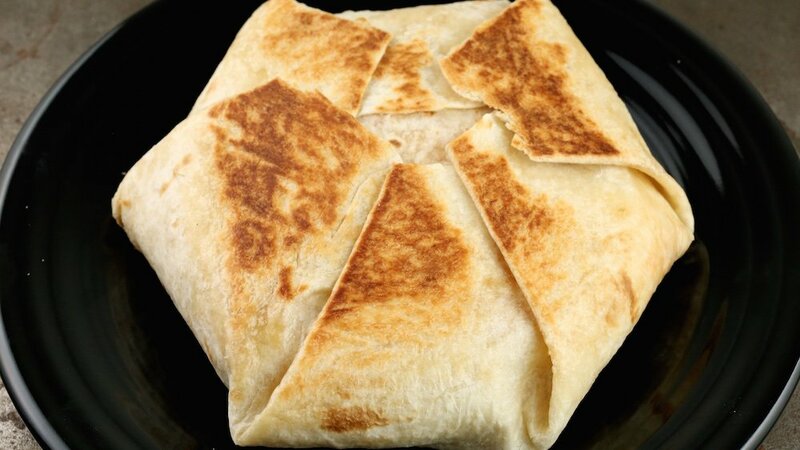 To fold into the actual crunchwrap, start with the bottom of the tortilla and fold the edge up to the center of the fillings. Keep doing that, folding as tight as possible, as you work your way around the tortilla. Spray another skillet or cooking pan with cooking spray and heat over medium heat. Place the crunchwrap supreme, seam-side down, onto the skillet. Cook for 2-3 min., or until golden brown. We loved these, they are simple to make and so yummy!!! MY teenage grandsons want these every visit. They are delicious! Made these in a smaller form today and they were amazing! I couldn’t find large enough tortillas so used the biggest I could find with half of a hard taco shell inside. Delicious! This was so good. We will make again. Omg I am obsessed with this recipe!!!! I crave this all the time. I couldn’t find tostada shells, so I just used a crunchy taco shell that I broke in half. I also ran out of shredded cheese, but the nacho cheese was more than enough. Don’t skip the nacho cheese! It makes the recipe. I absolutely love these and could eat them everyday. 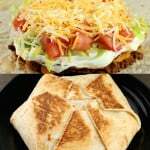 Is it posible to make the crunch wraps with chicken? If so would you recommend ground chicken/turkey or cooked shredded chicken. I make these for my family with the ground beef and they are a big hit. I have a friend that does not eat beef and I would like to make them for her. Can you help? Made this veggie style! But I had to cut a tortilla in half and add in order to wrap it correctly. Also. Instead of sour cream I used jalapeño ranch and added cilantro! Turned out great! A tostada shell is a fried corn tortilla. It’s a taco shell that hasn’t been folded. Loved these! I used refried beans instead of nacho cheese! Absolutely delicious! Hi, when you fold the Crunchwrap and you want to Brown it in a skillet how can you do that without the stuff coming out of it? I was super lazy and didn’t warm anything up prior to frying. This was so good and EASY to make. You rock. Now all the ingredients are in my fridge so all I have to do is assemble and fry whenever I want another crunchwrap supreme. Woohoo! well the first thing that is wrong is you are supposed to use refried beans first on the soft tortilla. then a round hard tortilla if you have one if not use tortilla chips. then the meat, cheese, sour cream, tomato or salsa and then lettuce fold it closed fry in a little butter. folded side first then enjoy cut in half for the best way to keep all things inside! Taco Bell’s Crunchwrap Supreme does not contain refried beans. I made these last night and my family could not get enough. So much better than Taco Bell, and made with better ingredients. I did make a few changes, to suit to our liking. I added refried beans as well as pepper jack cheese, and layered them in a slightly different order, with the addition of another tostada to keep the lettuce and tomatoes cool and crisp. Here is my order: Extra large Guerro burrito, refried beans, ground beef, queso cheese, tostada, sour cream, lettuce , tomato, tostado, pepper jack. Wrap it up and brown in the pan. The extra large burrito held everything nicely together, with no leakage. So yummy! So good. A favorite for the family. This is one of my favorite recipes for dinner ever. It’s so easy and everyone in the family loves it. I wasn’t sure how I would do with the whole folding thing but I watched the little video and got it on the first try. As long as you’re gentle it’ll turn out great. Best part is if you make the meat in bulk then you’ll have left overs. Lasted us for a week. Ate them for dinner one night and then had them a few different days for lunch. Highly recommend! If you don’t have diced tomatoes(canned/or fresh) it’s good with salsa. In New Mexico, we take a green chile burger and do pretty much the same… helps if you have pizza stone in your oven. Fold the tortilla over the pre-cooked burger/cheese/sauce and 10 min each side @425F convection. No dribble, no mess. Juices stay put. Enjoy! I fixed this for supper last evening, added refried beans, but would be fantastic just as it is. It is a keeper. These are easy and a real keeper!